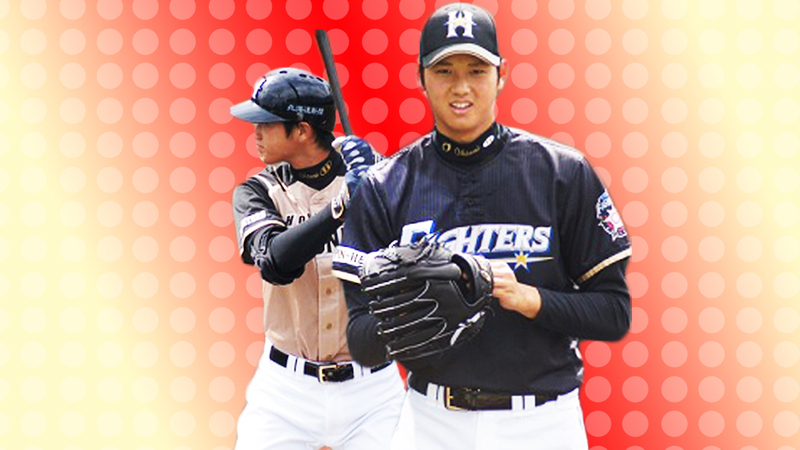 Shohei Ohtani is the number one prospect on THE BOARD. You are a bit spoiled. In our modern world, where information is over-abundant, scattered across multiple platforms, regurgitated, repurposed and otherwise modified from its original intent, it is nigh impossible to gather a complete, single-source data set, let alone one that is painstakingly curated by two experts. Why are you spoiled, you ask? Because this amazing data set, known as THE BOARD, is available, is sortable, and is totally free. Many baseball seasons ago, before I had my own credit cards, sites that hid their best content behind paywalls caused me a great deal of angst. How was I to read this content I wanted to read when I had no means to procure it? For this reason, high-quality content that is available to all holds a special place in my heart. THE BOARD, in my opinion, is a shining example of this philosophy. 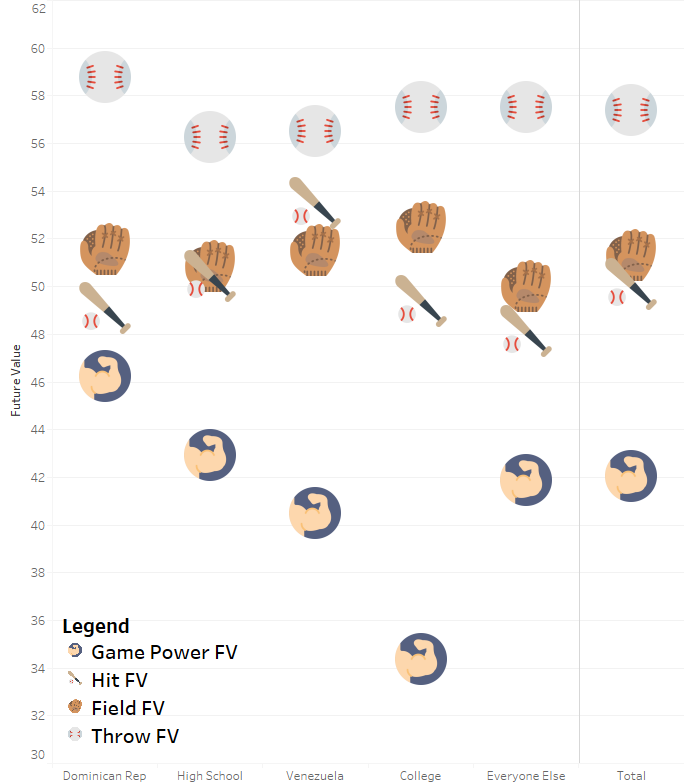 Today, inspired by THE BOARD, and in advance of the MLB DRAFT, we will, using visualizations built in Tableau, explore these data visually. The prospects included here are the 736 prospects on THE BOARD, based on their 2018 rankings, but does not include current draft eligible prospects. 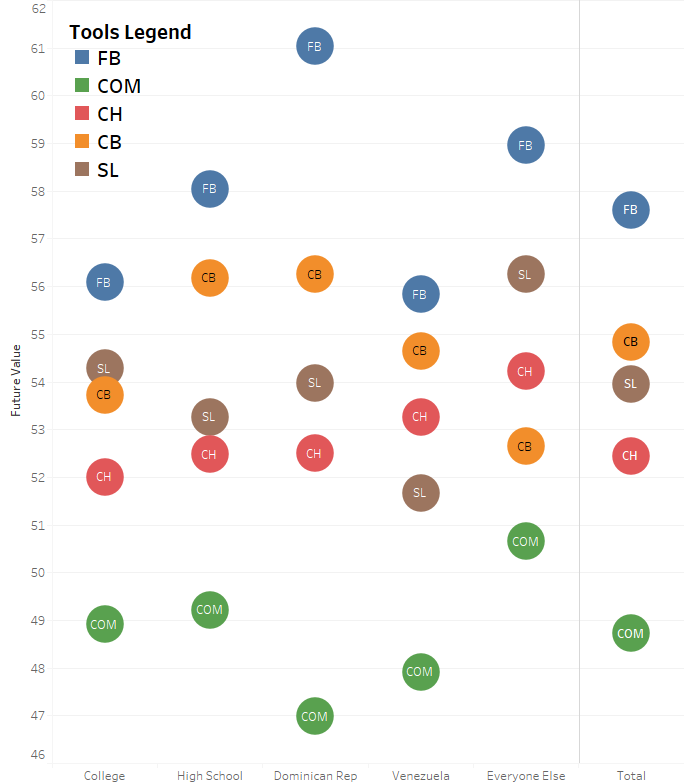 As we move up the athletic-defensive spectrum (up the middle vs four corners), we see a much higher proportion of prospects signed from high school as opposed to college, reflecting the “toolsy” outfield and shortstop prospects drafted out of high school that teams hope can develop the requisite baseball skills to become useful big leaguers. 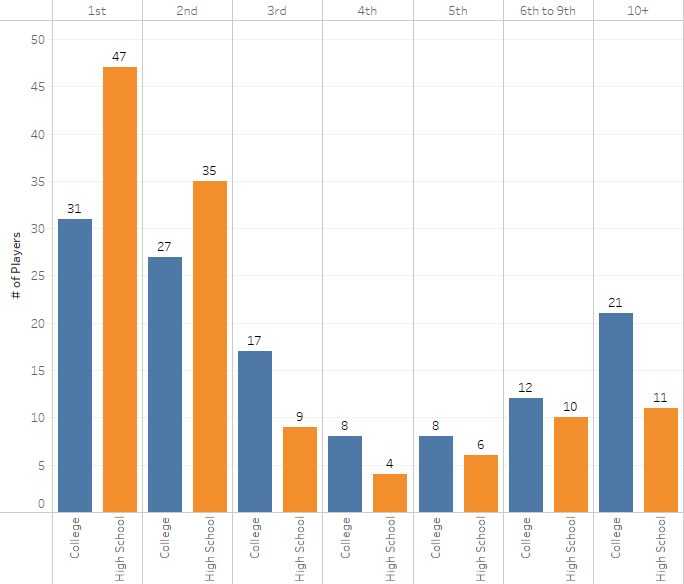 Interestingly, the 40 future value (FV) prospect pool is almost evenly split between college bats and high school bats. North America in the above chart refers to draft-eligible players, including the USA, Canada, and US Territories like Puerto Rico. This graph tells a much more interesting story. First, we see when players are younger, they are far less likely to be projected as first basemen, with the vast majority of first base prospects originating from North America, the bulk of whom come from the college ranks. Next, and perhaps unsurprisingly, we see that despite roughly 65 percent of prospects originating from North America, 63 percent of shortstop prospects come from the international ranks. This is likely a reflection of what is easiest to scout at a really early stage: elite infield defense. If a young international athlete shows elite defensive tools, he is worth investing in, since the offensive bar for an elite defensive shortstop is a lot lower than for other positions. Projecting a 16-year-old’s offensive ceiling seven years down the road is almost impossible, even for “generational” talents such as Angel Villalona, Kevin Maitan and Wilmer Flores, who all at various points received the vaunted “Miguel Cabrera” comparison, but have produced quite variable results. This is not a critique of the scouting community’s assessment of elite 16-year-old baseball players; rather, it is a commentary on the impossibility of projecting the future hitting talents of really young players. The second interesting thing we see is the relative dearth of catching prospects from the international ranks. My opinion is that this is likely representative a similar (but opposite) dynamic as at shortstop. Specifically, being an MLB catcher requires a great arm, a deep understanding of the game, and enough of a bat that it can withstand the rigors of catching. If you’re a young player looking to get signed by an MLB team, it’s far easier to convince that team you’re worth signing if you can throw a baseball hard and can pitch, or have elite defensive actions. Convincing a team you’re worth a 7-8 year investment in developing as a catcher is a much tougher sell. Market forces naturally will push athletes who might have enough arm to play catcher to the mound, where even just a great fastball can be worth an investment. 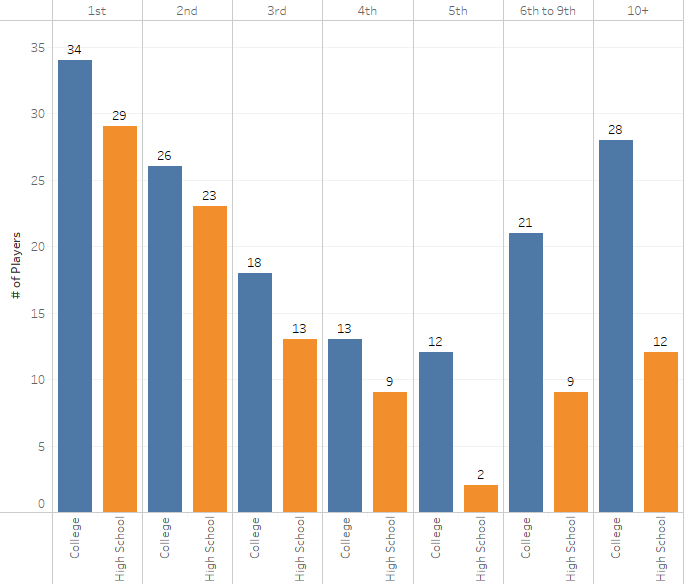 Given the long development time frame for catchers, it makes sense that the plurality are from the college ranks. 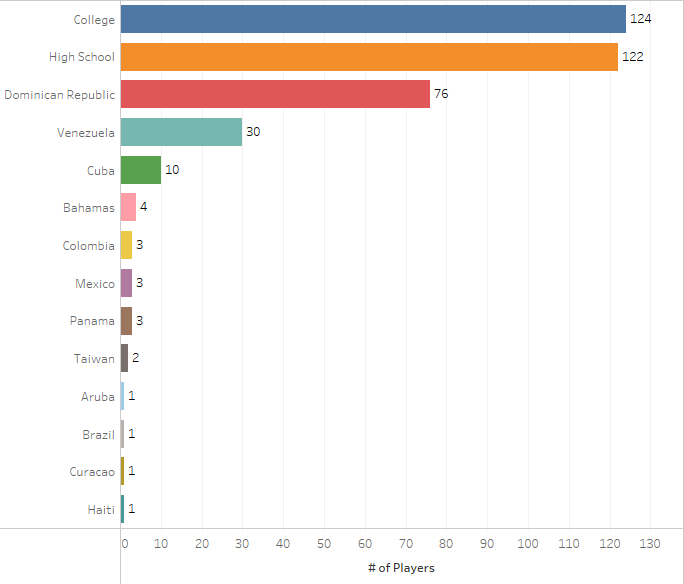 The vast majority of prospects are coming from high school and college, followed by the Dominican Republic and Venezuela. Of the 30 prospects from Venezuela, 10 of them are shortstops and six are center field prospects. For the following graphs, we’re going to group the views into five groups: high school, college, DR, Venezuela and Everyone Else. The “muscle” icon represents the average FV for the game power tool and is much lower for the group of prospects who were signed out of college. Most shortstop prospects who project for even average (50 FV) power likely will get signed right out of high school, leaving colleges with shortstops with strong field and throw tools. 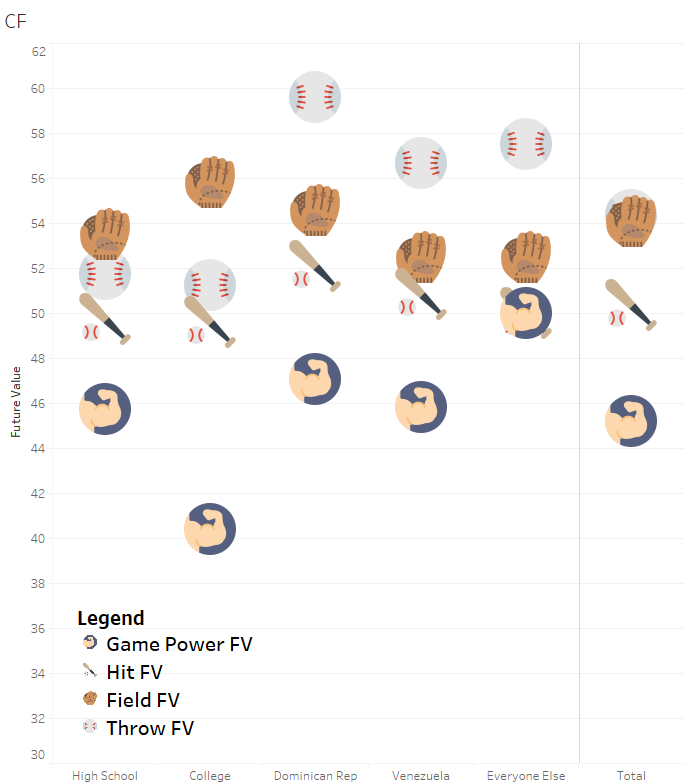 Whereas shortstop prospects from the Dominican have the highest average game power FV, Venezuelan shortstop prospects show the highest average hit (bat+ball icon) future value. The 12 Dominican center field prospects, as a group, have well-above-average arms. College center field prospects share a similar dynamic to their shortstop counterparts, as average throw/field/hit guys with well-below-average power. 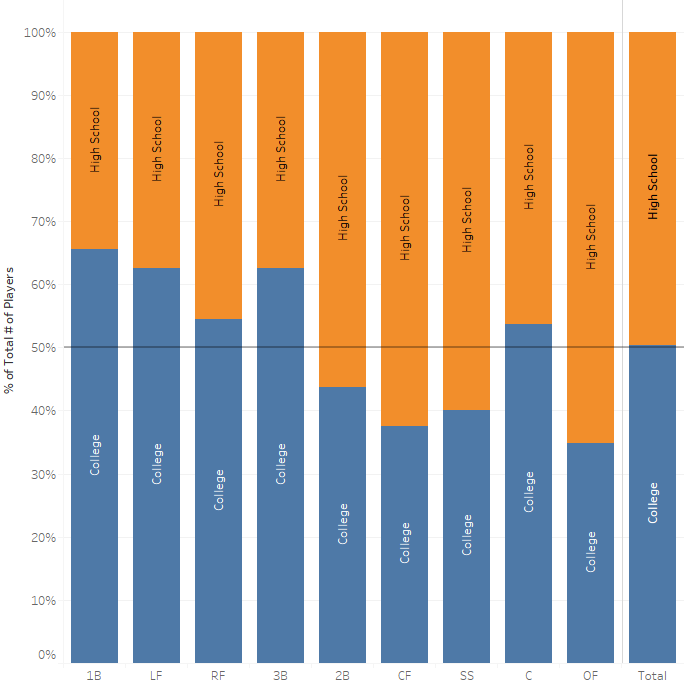 When we looked at the breakdown for batters, we saw a nearly even split between college and high school hitters. For pitchers, there are far more legitimate prospects who came from the college ranks. (We’ll take a look at what’s driving these dynamics later.) 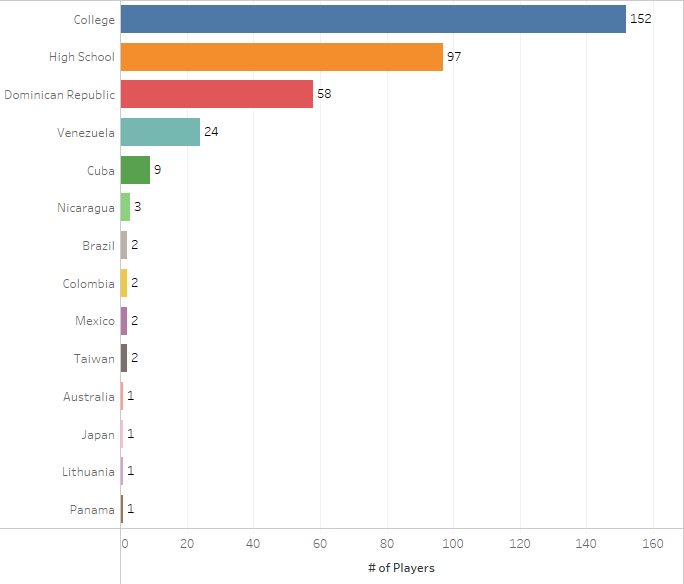 Keeping in mind there may be a lot more “depth” prospects coming from the college ranks, let’s take a look at the average pitching prospect by tools and country of origin. The Dominican Republic once again dominates the “loud” tool, in this case the fastball, at the expense of the “command” tool, which grades out (on average) as the lowest. We saw a similar trend with the Dominican shortstop prospects, where they had the most power but (slightly) below-average hit. As these tools are often a trade-off (throw the ball harder, sacrifice a little command; swing harder, lose some bat control), it could be a product of approach and training at a young age, which makes sense when you consider you’ve never heard of a July 2 prospect being described as the “next Greg Maddux”, since no 15-year-old is going to be able to demonstrate enough command to get a sizeable contract. If you’re developing a young athlete, you’re far better off having him show the loudest, easiest to measure tool (raw power and fastball velocity) than developing the more “refined” skills. We mentioned above the larger quantity of pitching prospects coming from the college ranks as opposed to high school. Let’s take a look at where these players are being drafted from, by round, followed by a look at tools by round. Let’s start with Batters. High school hitting prospects are far more likely to be drafted in the first couple of rounds, where they are significantly more prevalent than their college counterparts. High school prospects who aren’t good enough to be drafted in the first couple of rounds are unlikely to develop into meaningful prospects and likely will go to the college ranks. This is a great indicator of how good talent evaluators are at assessing high school hitting prospects, something that is more difficult to do for pitching prospects. In contrast to high school batters, there are a lot more legitimate prospect arms to be found among the high school ranks, even at the later rounds in the draft. We also see consistently more college talent than high school talent, regardless of where they were drafted, supporting the notion that pitching takes longer to develop. The distribution of talent for batters skews very much to the first couple of rounds, whereas pitchers produce value, even when drafted much later. This is a reflection of the relative difficulty in projecting pitchers as opposed to hitters. 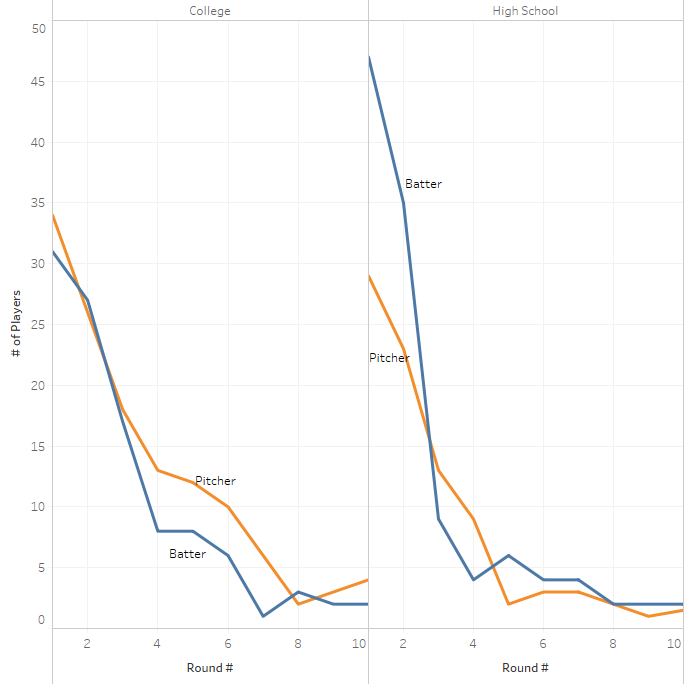 Between rounds four and eight, college pitchers are far more likely to develop into prospects than college bats, which makes sense when you consider it’s more likely for a pitcher’s stuff or command to improve, or fall under the radar, especially if they’re just a lottery arm with mid 90s heat. Where Are Top Prospects Drafted? 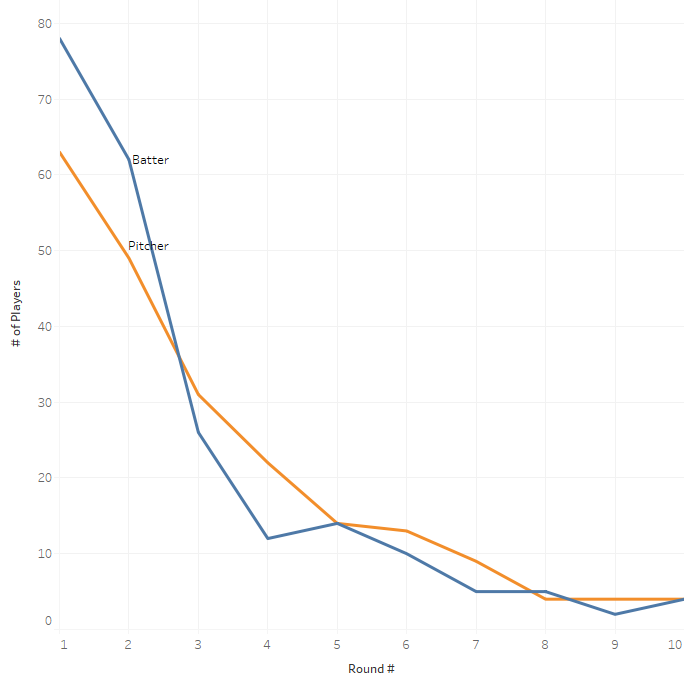 Let’s take a look to see how easy (or hard) it is to find elite prospects in the later rounds, starting with batters. 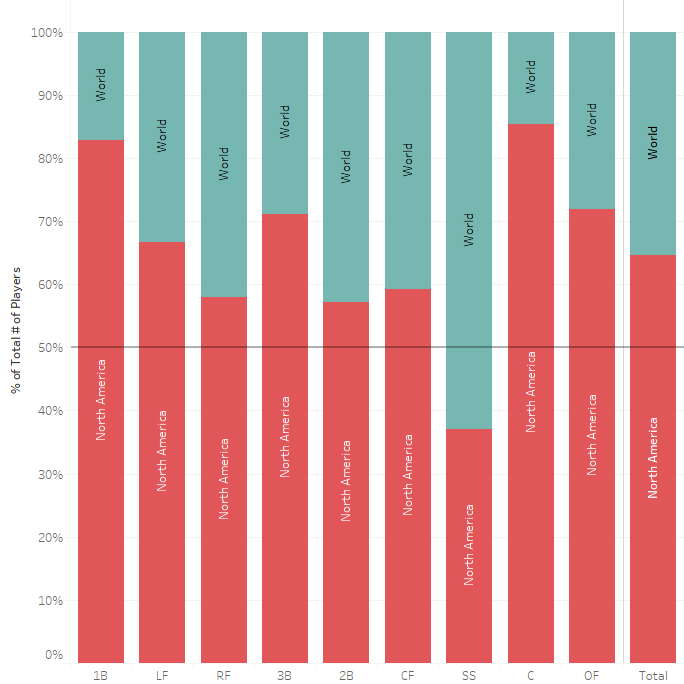 We’ve split future value (FV) into four groups: 40 FV, 45 FV, 50 FV and 55+ FV for the overall FV tool. A 40 FV reflects a future bench player, 45 FV a Util/Platoon guy, 50 an average regular and 55+ above average to star contributor. For a more detailed breakdown, read Kiley’s full explanation. 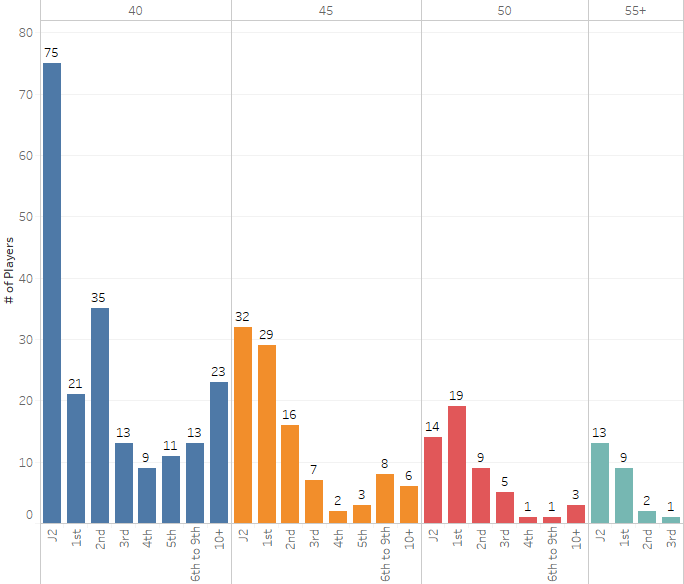 We see a distribution we’d expect to see; almost all the above-average talent (55+ FV) is scooped up in the first round, with a few slipping past. After the third round, it is very difficult to find a future average major leaguer (50 FV). There are an abundance of replacement-level/bench players available throughout the draft, as well as a lot of high draft picks that don’t project to have much major league value. While a lot of July 2 prospects don’t project to be very valuable, the 13 55 FV+ batters signed during the July 2 period show how vital international scouting is to developing a team’s pipeline. You could have a perfect evaluation of every high school and college prospect and still miss half of the elite hitting prospects. Let’s take a look at the distribution of pitching prospects. A total of 13 pitchers drafted outside the first round project to be at least average major league starters, demonstrating that it is extremely difficult to find an elite arm in the draft after the first round. 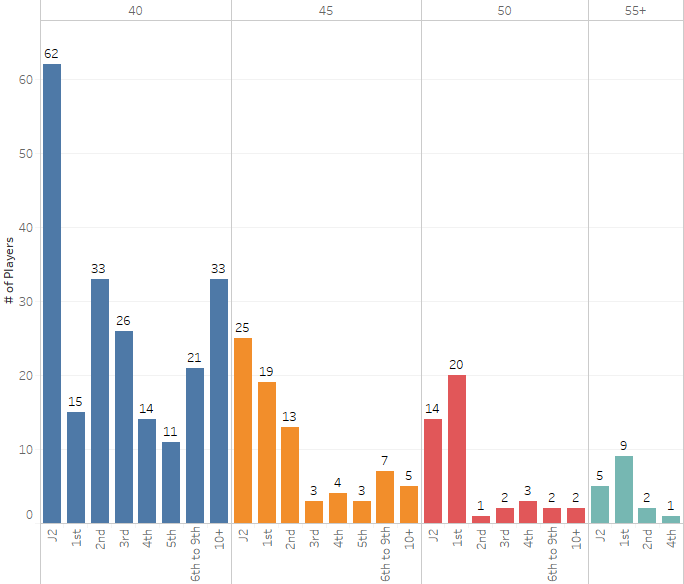 The contrast of 50 FV batters, where 14 were drafted in the second and third rounds, to pitchers, where three were drafted in the second and third, suggests that, generally speaking, teams shouldn’t be drafting pitchers past the first round, other than for depth. International scouting is still critical here. However, the top pitching prospects (right now) are mostly from college and high school (other than one obscure Japanese prospect). This also appears to be the case in the major leagues, with all the top pitchers this season (save Luis Severino) coming from North America. Since 2016, only Carlos Carrasco, Severino, and Jose Quintana rank in the top 15 in fWAR. THE BOARD is a fantastic resource, giving you detailed, sortable scouting data on 736 prospects. Today, we focused our attention on MLB affiliated prospects, specifically, those listed on the “Prospects List” tab. THE BOARD now also includes a recently updated 2018 MLB Draft BOARD, which is equally awesome, and includes 12 50 FV or higher prospects, 7 from college and 5 from high school. Sort it! How else can can you impress all your friends with your knowledge that Lenny Torres, Jr. is the only 40 FV+ pitcher in the 2018 MLB draft with ++ athleticism? Or that Sean Hjelle is the tallest 40 FV+ pitcher in the draft at a robust 6’11”? This is awesome. I really am spoiled. of the “All” tab do not show up — at all — in the individual position tabs. For example, Francisco Mejia is listed under the “All” tab as “C/3B” but does not show up under either the “C” tab or the “3B” tab. “suggests that, generally speaking, teams shouldn’t be drafting pitchers past the first round, other than for depth.” — insofar as the name of the game is to get good scouting grades. But if pitching prospects’ careers often make a liar of their grades, then picking late round pitchers does make sense. And I should have said, nice article and data! We are extremely spoiled, the only way we could be more spoiled is if THE BOARD were exportable to csv.